I’m a longtime, diehard Tweetbot user and it’s been one of my favorite apps on the platform since it’s debut nearly seven years ago. But Nick Heer recently pointed out a nifty feature that’s exclusive to Twitterrific — “Delete and Edit Tweet”. Many Twitter users have been clamoring for the ability to edit tweets and the folks at Iconfactory have developed a clever workaround. When you choose the option, through the ellipses menu on one of your tweets, Twitterrific will delete the selected message and open a compose view with the contents of that tweet filled in. This gives you the ability to quickly fix typos or grammatical errors without having to go through multiple steps to accomplish it. I wish that I could hide display names in the timeline. I tend to prefer minimal user interfaces and would rather my Twitter app only show usernames within the timeline. If I want to see a user’s display name, I’m more than willing to tap their avatar to see it in their profile view. Display names aren’t used within tweets for mentions or replies, so why should they be emphasized in the timeline? I find myself searching Twitter several times each day and wish I could set the search view as a tab, but there’s no option to do so. The only way to access it is through the sidebar, which adds another interaction to the process — tap or swipe to open the sidebar and then tap again to open the search view. I’m not happy with the font options in the app. 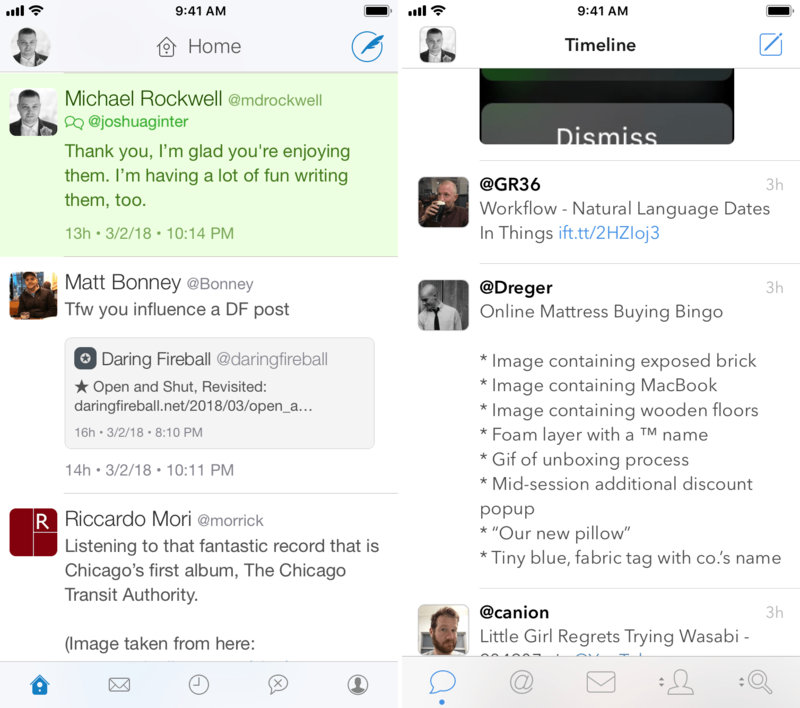 I’ve used Avenir in Tweetbot for a couple of years and it looks like trash in Twitterrific. The weight is too heavy for my taste and it looks sort-of blurry — it’s not crisp and clean like it is in Tweetbot. I’ve settled on using Helvetica Neue with a slightly increased line height. I’m not in love with it, but it’s better than all of the other options. I don’t like how replies are displayed. I wish usernames were included within the tweet rather than being displayed on their own line above the tweet’s content. The unified timeline is Twitterrific’s best feature. Displaying all of your mentions and replies within your primary timeline, whether you follow the person or not, is absolutely brilliant. If Tweetbot was to steal one feature from Twitterrific, I hope it would be the unified timeline. The Project Phoenix icon is gorgeous — one of the best app icons on my device. In Tweetbot, when you setup a mute filter, you can choose an expiration date. This is perfect for hiding tweets about a specific event during its duration to prevent spoilers and keeps your mute filters tidy by automatically removing them after their specified timeframe. Twitterrific doesn’t have that ability. Muffles, as they call them, are either on or off — there’s no way to set an expiration date and that’s pretty lame. I keep my iPad in landscape mode the vast majority of the time, but Twitterrific gives you no way to hide the tab bar in this view, even if you have the sidebar displayed. And the sidebar is necessary to keep line length reasonable. You’re forced to choose between good line length and redundant user interface elements or terrible line length. Both of those options lead to a bad user experience. I understand what they’re trying to do, but I don’t like the use of emoji in notifications. It doesn’t do enough to help me distinguish between mentions, likes, and so on. It only feels like it’s adding to the noise. I’m not fond of how tweets are dated. I don’t need relative and absolute dates on each tweet. And displaying this information below the contents of the tweet — instead of right-aligned next to the username as Tweetbot does — adds unnecessary height to each tweet giving you less content on the screen at once. I enjoy the use of color within the timeline to differentiate between your own tweets, mentions, and everything else. It’s a nice touch. Twitterrific is a well-made application with some bright spots, but after spending a week with it as my primary Twitter client, I’m going back to Tweetbot. I’ll miss the Project Phoenix icon in my dock and the utility of the unified timeline, but those two features aren’t enough for me to make the switch. Tweetbot features beautiful type, a perfectly minimal user interface, and it makes better use of screen real estate on the iPad with the multicolumn view. Overall, Tweetbot is still the best Twitter client on the platform.